One of the most popular webinars I’ve ever worked on, The Science of Timing was also one of my favorite. If you haven’t seen it, go check out the on-demand recording now. In it, I present data I’ve collected over three years about the effect timing has on a variety of online marketing activities, including blogging. Below is an infographic that represents a collection of the three most important stats I have about when to publish blog posts. In the webinar, I also make the point that my results are based on huge aggregates of thousands, millions, or even in some cases, billions of lines of data. They might not represent the exact best times for your industry. What they represent is a set of times to experiment with, using your own audience. As in the medical science field, researchers conduct experiments with hundreds or thousands of subjects and find best-practice courses of treatment. In individual cases, doctors start with these best-practices and if they work, great. If they don’t work, they experiment with the next course of treatment. Marketing science is like this. Use my data as a starting point for your own experimentation. Since most Americans live in the eastern time zone, the times below are ET. I’ve studied the relationship between Twitter success and politics before, and since this year is a big year in elections, I figured I’d do it again. This time I looked at how the 4 front-running republican presidential candidates are doing on Twitter. I analyzed the obvious numbers, followers, retweets and mentions, but I also looked at a few of my favorite, deeper metrics: retweets-per-follower, link-percentage and reply-percentage. I also looked at Twitter “penetration” in two upcoming primary states: South Carolina and Florida. Notice anything that surprises you in this data? One of the most interesting patterns I’ve found while studying social media and marketing data is what I call in my book “contra-competitive timing.” I’ve found in numerous cases that the most successful times and days to publish new content are off-peak times. It’s like when you’re at a noisy party and it’s hard to hear the person talking to you 2 feet away, but suddenly you say something awkward and the room quiets down. Now everyone can hear you. The same is true with the internet. When there is less other noise to compete with (ie fewer Tweets, emails, blog posts, etc) your content can gain attention more easily. The infographic below showcases some of the best examples of this phenomenon I’ve identified. If you like myth busting social media data like this, be sure to buy my newest book, Zarrella’s Hierarchy of Contagiousness. One of the social media questions I’m most interested in is about whether Twitter is best suited for conversation or broadcasting. To many people’s surprise, I generally find myself on the broadcast side, and most of the data I’ve analyzed seems to back me up. Just yesterday, I started a little informal Twitter poll and found that respondents were pretty evenly split between broadcasting and conversation. This time, I looked at more than 100k randomly chosen active Twitter accounts and their Tweets. I analyzed the percentage of their Tweets than contain a link as well as the percentage that began with an @. I also measured the percentage of their last 100 Tweets that were ReTweeted. I found that accounts that had high link-percentages between 60% and 80% had the most ReTweets and accounts with low reply-percentages between 0% and 10% had the most ReTweets. Also during 2011 I published some of my favorite data. As the year wraps up and we get ready to celebrate the coming of 2012, here’s a list of my 10 most popular posts. A heatmap showing where to place links in your tweets to get the most clicks. 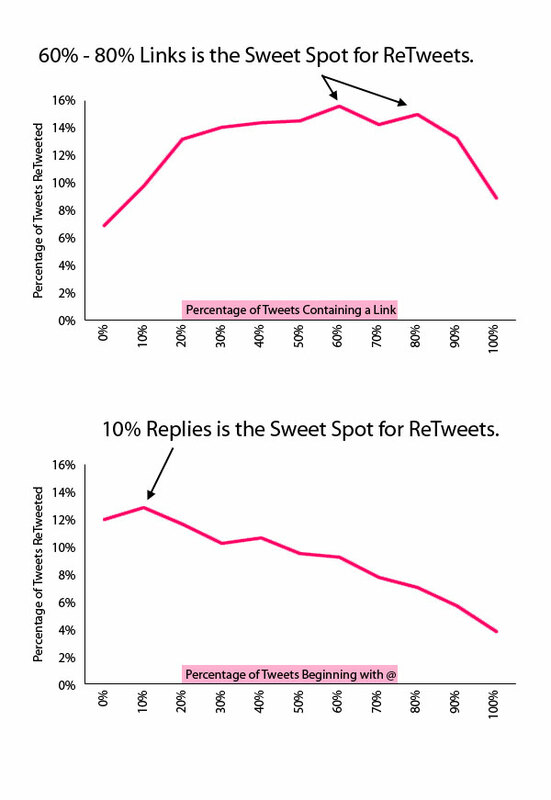 An infographic-style collection of my top data about how to get your tweets ReTweeted. A list of words correlated with higher (or lower) clickthroughs on links in Tweets. Data showing that a sizeable percentage of all Facebook content creation is done from mobile devices. Another infographic-style collection, this time with data on how to get more followers. Data-based answers to five important questions about Facebook marketing. Statistics showing a positive correlation between the number of links a Twitter accounts tweets and the number of followers it has. Data showing the optimum Facebook wall posting frequency. My most controversial post of 2011, this data challenges the popular “engage in the conversation” myth. The words correlated most closely with connections (both positive and negative) on LinkedIn profiles. What was your favorite post of 2011? If you like social media data and science like this, buy my latest book: “Zarrella’s Hierarchy of Contagiousness. Science makes everything better. Seriously, it’s a proven fact. So of course I did some analysis about Christmas and found some surprising insights. Don’t get fooled by the unicorns-and-rainbows myths about the holidays anymore. Here’s the science. Enjoy and Merry Christmas and Happy New Years! The recent launch of Marketing Grader is a boon for me because it gathers a ton more data than its predecessor, allowing me to analyze all sorts of stuff I couldn’t before. One such area of exploration, is the relationship between a brand’s Klout score and the successfulness of its website. Among its 38 metrics, Marketing Grader analyzes the Klout score of a brand’s Twitter account, the number of domains linking to the brand’s website (as reported by SEOmoz) as well as the number of unique visitors it gets (as reported by Compete). When I analyzed the relationship of these numbers I was surprised at what I found. Brands with higher Klout scores tended to get more visitors and more links. And when they have really high Klout scores (like above 70) they get far more traffic and links than other sites. Of course this isn’t causation, but correlation. It means that Klout may be a surprisingly effective measure of overall online marketing success. The data tells us, not only only does Klout-measured social media influence translate into more traditional measures of web marketing effectiveness, but also that the web is a very winner-take-all kind of place. There are essentially two kinds of brands online, those with a ton of influence, traffic and links and those with very little. I’ve studied data from a variety of social media platforms, but never LinkedIn. So a few days ago I got around to playing with it a little bit and found a few interesting things. First, I looked at the words in the title and summary of more than 40,000 randomly selected profiles and how they correlated with the number of connections those profiles have. I found that there are a handful of highly connected positions (unsurprisingly investors and recruiters) as well as under-connected titles (religion and healthcare). The infographic below shows the 20 most connected common words (and the 20 least connected words) found in titles and summaries. The vertical axis is the percentage more (or fewer) connections profiles using those words had compared to the average in my dataset.